Objective: Central poststroke pain (CPSP) is usually difficult to treat. Amitriptyline, the only oral preparation shown to be effective in a randomized controlled trial, is often associated with a range of side effects related to the many mechanisms of actions of tricyclic antidepressants. We investigated the effect of lamotrigine, a drug that reduces neuronal hyperexcitability, on poststroke pain. Methods: Thirty consecutive patients with CPSP (median age 59 years, range 37 to 77; median pain duration 2.0 years, range 0.3 to 12) from two centers participated in a randomized, double-blind, placebo-controlled cross-over study. The study consisted of two 8-week treatment periods separated by 2 weeks of wash-out. The primary endpoint was the median value of the mean daily pain score during the last week of treatment while treated with 200 mg/d lamotrigine. Secondary endpoints were median pain scores while on lamotrigine 25 mg/d, 50 mg/d, and 100 mg/d; a global pain score; assessment of evoked pain; areas of spontaneous pain; and allodynia/dysesthesia. Results: Lamotrigine 200 mg/d reduced the median pain score to 5, compared to 7 during placebo (p = 0.01) in the intent-to-treat population of 27 patients. No significant effect was obtained at lower doses. Twelve patients (44%) responded to the treatment. There was a uniform tendency to reduction of all secondary outcome measures, but lamotrigine only had significant effects on some of the secondary outcome measures. Lamotrigine was well tolerated with few and transient side effects. Two mild rashes occurred during lamotrigine treatment, one causing withdrawal from study. Conclusions: Oral lamotrigine 200 mg daily is a well tolerated and moderately effective treatment for central poststroke pain. Lamotrigine may be an alternative to tricyclic antidepressants in the treatment of CPSP. At present, the tricyclic drug amitriptyline is the only oral drug that has a documented beneficial effect in poststroke pain,12 but many patients fail to respond to this treatment. Tricyclics are limited by multiple side effects to which stroke patients are especially susceptible. A placebo-controlled study demonstrated a significant, yet short-lasting, effect of IV-administered lidocaine in CPSP.13 Although other oral drugs (such as the sodium channel blockers carbamazepine and mexiletine,12-14⇓⇓ the opioid antagonist naloxone15 and the gamma-aminobutyric acid B receptor agonist baclofen16) have been reported to be effective in the treatment of CPSP, none of these treatments have proved to be effective in controlled clinical trials. Previous studies have shown the importance of excitatory amino acids and open sodium channels in neuronal hyperexcitability and in synaptic transmission.17 Blockade of glutamatergic activity or sodium channels may therefore be a rational approach for treating poststroke pain. Lamotrigine is an antiepileptic drug which acts by inhibiting sodium channels presynaptically and suppressing release of glutamate.18 Controlled clinical trials19-21⇓⇓ and animal studies22 have documented a pain relieving effect of lamotrigine in peripheral neuropathic pain conditions. Case reports23,24⇓ also suggest a beneficial effect in patients with central pain. This study examined the analgesic effect of oral lamotrigine 200 mg daily on spontaneous and evoked pain in patients suffering from CPSP. Between July 1997 and December 1998, patients from two neurologic centers (Aalborg Hospital and Aarhus University Hospital) with a previous stroke episode and who had pain for more than three months were invited to participate. Candidates for the study were recruited from either patient referral to the two neurologic clinics or advertisement in the local newspapers. Patients were eligible if they were older than age 18 and had had pain following a stroke for which nociceptive, peripheral neuropathic, and a psychogenic origin was considered highly unlikely.25 All patients underwent a complete neurologic examination, quantitative assessment of thermal and mechanical sensation, and an MRI or CT scan of the brain. The baseline median pain intensity on a scale 0 to 10 (0 = no pain and 10 = unbearable pain), assessed the week before randomization, was required to be ≥4. Patients were excluded if they had dementia or any other severe cognitive impairment, diabetic neuropathy, malignant disease, recent myocardial infarction, severe heart insufficiency, liver/renal failure, or a known allergy to lamotrigine. Patients with a positive history for alcohol or drug abuse, or females who were pregnant or lactating were also excluded. Women of childbearing potential were required to use contraception during the trial period. Thirty-one patients met all entry criteria and agreed to participate. One patient withdrew consent before receiving the study drug, so the total number of patients randomized was reduced to thirty. The study was approved by the National Board of Health and the local ethical committees. All patients gave their informed signed consent after receiving written information about the study, which was carried out in accordance with guidelines known as Good Clinical Practice (GCP). The study was designed as a randomized, double-blind, placebo-controlled cross-over trial. A 1-week baseline period was followed by two 8-week treatment periods, separated by a 2-week wash out period. In order to avoid the risk of rash, the dose of lamotrigine was gradually increased every second week in accordance with manufacturer’s guidelines (25 mg/d to 50 mg/d to 100 mg/d, ending at 200 mg/d). Trial medication was administered as soluble lamotrigine or identical placebo tablets in doses of 25 mg and 100 mg. Patients were randomized to treatment according to a computer generated randomization list with a cluster size of six, and allocated by the clinical investigators consecutively using lowest numbers first. Code envelopes were kept by the investigator during the trial and returned unopened to the monitor after termination of study. The blind was maintained until a complete data analysis had been carried out. Concomitant use of antidepressants, antipsychotics, antiepileptics, or any analgesics were not allowed during the trial because of their potential pain relieving effect. Patients using one of the above drugs were gradually tapered off their medication before beginning the trial. Use of monoamine oxidase inhibitors was not allowed in the last 14 days prior to start of trial medication. Acetylsalicylic acid 300 mg daily (as antithrombotic agent) and paracetamol 500 mg as needed (which was used as escape medication during the entire trial) were allowed. Pain assessment included a measure of ongoing pain and evoked pain to brushing, pricking, and cooling the skin. Ongoing pain, defined as the average pain each day, was rated daily (at 6:00 pm) by the patient on a 11-point (0 to10) Likert scale. This was recorded along with the amount of escape medication used in a patient-maintained diary. A global pain score was obtained at the end of each treatment period by measuring the mean physical pain during the past 4 weeks (no pain = 0, very mild pain = 1, mild pain = 2, moderate pain = 3, strong pain = 4, very strong pain = 5), and the mean degree to which pain affected daily activities the past 4 weeks (not at all = 1, a little = 2, some = 3, a lot = 4, very much = 5). Stimulus-evoked pains were measured on an 11-point scale (0 to 10), and were assessed by recording the response to an electrical toothbrush (Braun D3) rubbing of the skin for one minute; von Frey hair stimulation (Semmes–Weinstein monofilaments, Stoelting Co., Wood Dale, IL) (1.5 × pain detection threshold); and to cooling by applying an acetone drop to the skin. The evoked sensation was measured at the end of each stimulus. All stimuli were applied at the same most painful site of the skin, and in the same order. Each stimulus was applied after pain evoked by the preceding stimulus had vanished. The size of the painful area was mapped on a standardized phantom drawing at the end of each treatment period. The circumference of the painful area was digitized (ACECAD D 9000 + digitizer, Monterey, CA), and the area calculated using SigmaScan (Jandel Scientific). Evoked pain was measured before study start and at end of each treatment period. Each type evoked-pain stimulus was administered by the same investigator (KV, GA, BTK). Side effects during the study were assessed by standardized open questioning of patients, and were blindly recorded as mild, moderate, or severe. For all recorded side effects, investigators judged the likelihood that lamotrigine was the cause. The primary endpoint of the study was the median pain score during the last week of treatment with 200 mg/d lamotrigine or matching placebo. The median pain score during the last week of treatment with 25, 50, and 100 mg/d lamotrigine or matching placebo served as secondary endpoints. Additional secondary endpoints included the two outcome measures in the global pain rating; the pain score to stimulation with the electrical toothbrush, von Frey hair, and acetone drop; area of spontaneous pain and dysesthesia/allodynia; and the intake of paracetamol tablets. Based on the known severity of poststroke pain and the general poor response to treatment, it was decided that a pain reduction of 2 on a 0 to 10 scale would be a clinically significant effect (and patients obtaining pain reduction ≥2 were classified as responders). On the global non-linear pain scale, a reduction of one step was considered to represent a clinically significant effect. Sample size was determined prior to the start of the study to be 22 patients, with an estimated effect of 60% for lamotrigine treatment and 15% for placebo treatment (type1 error = 0.05, type 2 error = 0.10). All efficacy measures and data analysis were based on an intent-to-treat (ITT) population, defined as the number of patients that received at least one dose of 200 mg/d lamotrigine or placebo. Non-parametric statistics (Wilcoxon Signed Rank Test) were used for analysis of primary and secondary endpoints, except for the area of pain extension, which was calculated using analysis of variance (ANOVA). The analysis accounted for the cross over design. All tests were two-sided with a significance level of 5%. Safety analysis of persons with adverse events was based on the total safety population (N = 30) using McNemar’s test for paired binary observations. All 30 patients entered in the study had a positive history for clinical stroke with at least one lesion disrupting the relevant spino-thalamo-cortical pathway. Two patients had no visible lesion on the MRI. However, clinical examination was compatible with a stroke in both of these patients, one having signs of a left pontine lesion with vertigo, dysarthria, and bilateral Babinski response; and the other patient having signs of a deep lacunar infarction in the left hemisphere. MRI scans of two patients could not be done due to a cardiac pacemaker in one and patient refusal in the other. In both these patients, a CT scan was done instead. The median pain baseline score for the 30 patients in the last week prior to randomization was 6 (range 4 to 10). The patient flow during the trial is shown in figure 1. Twenty-six of the 30 patients completed the first treatment period. Three patients withdrew consent due to the occurrence of adverse events during lamotrigine treatment. A fourth patient did not complete the first treatment period due to lack of pain relief, but continued the study in the second treatment period. Twenty-seven patients entering the second treatment period all achieved the primary endpoint, thus forming the ITT-population. Four patients withdrew consent during the last two weeks of the trial due to lack of efficacy, and one patient was discontinued due to a protocol violation (did not take the prescribed dose of the trial medication). After the study ended, we identified two patients who had committed minor protocol violations by taking concomitant analgesics during the study, reducing the peer-protocol population to 20 patients. Clinical data for patients in the study population are summarized in table 1. Figure 1. Profile of the randomized, controlled, cross-over trial. *One patient did not complete the lamotrigine treatment period, but continued in the placebo period. During lamotrigine treatment, the median pain score decreased, gradually reaching “5” in the last week on lamotrigine 200 mg/d (the primary endpoint); whereas the pain score remained unchanged at “7” during placebo treatment ( figure 2) (p = 0.01). Three patients with missing values for the primary endpoint in the second treatment period were assigned the median of the remaining pain scores, based on the patients with the same treatment sequence. No period or carry-over effect was found. No difference in pain scores were found for the other doses: 25 mg (p = 0.07), 50 mg (p = 0.35), or 100 mg (p = 0.10) compared with placebo (secondary endpoints). Figure 2. 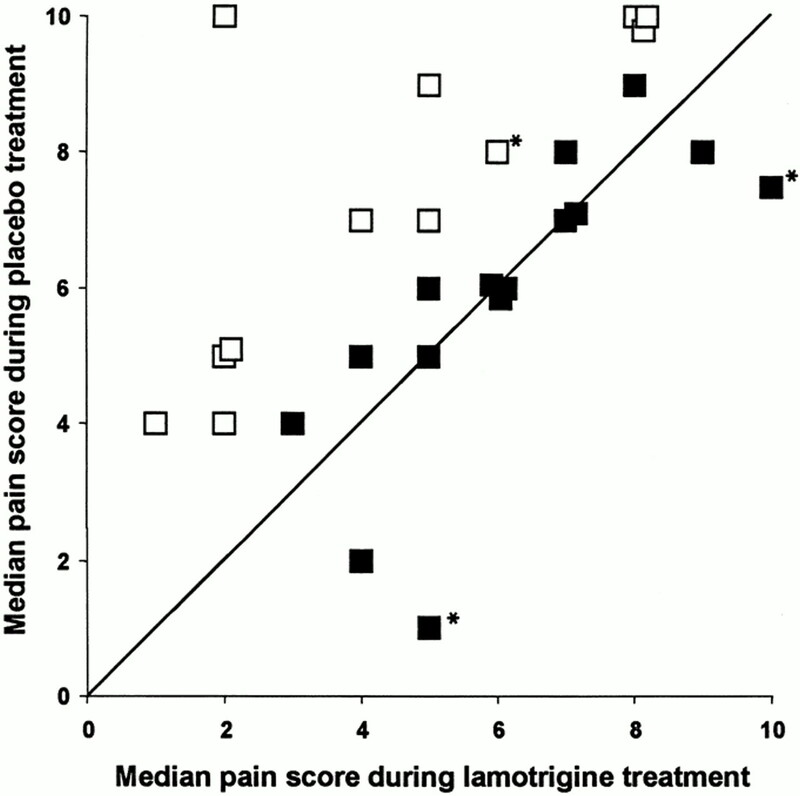 Median pain scores during lamotrigine and placebo treatment (25% and 75% quantiles are indicated). ▪ = Lamotrigine; □ = placebo. *Significant difference from corresponding placebo value. The pain assessments for each patient in the last week during the two treatments are shown in figure 3. Twelve patients were clinical responders to lamotrigine, as indicated by a lamotrigine pain score that was two or more points lower than the corresponding placebo value. Eleven patients had no difference in pain scores between the two treatment periods; and in three patients, the placebo score was two or more points below the lamotrigine score. Figure 3. Median pain scores of all patients of the intent-to-treat population in the last week during lamotrigine treatment compared with placebo. □ = Responders; ▪ = nonresponders. *Data replaced due to missing values. The global pain assessment of physical pain in the last four weeks of lamotrigine treatment was 3 (moderate), compared to placebo where the median score was 4 (strong) (p = 0.02). The other global pain measure of pain affecting daily activities showed a median score of 3 (some) on lamotrigine treatment compared to 4 (a lot) during the placebo period, (p = 0.11). The use of escape medication (paracetamol 500 mg) was low during the entire trial (median 0 tablets), with no significant difference between the four lamotrigine dosing periods. Measurement of evoked pain intensity revealed a reduction in median pain score for acetone droplet during lamotrigine treatment (p = 0.01), but with no difference for evoked pain to toothbrush (p = 0.23) or von Frey hair stimulation (p = 0.13). The area of spontaneous pain or area of dysesthesia/allodynia during treatment with lamotrigine and placebo were not significantly different. However, for all secondary effect measures there was a trend toward reduction in favor of lamotrigine treatment ( table 2). The diagnosis of CPSP requires exclusion of other common causes of pain and the presence of a stroke episode which is temporally linked to the pain.25 It is difficult to be certain that all other causes of pain in patients in this study have been excluded. The diagnosis of CPSP was established on the basis of clinical criteria similar to those used by others3,8-11⇓⇓⇓⇓: 1) pain in an area with sensory loss explained by a specific CNS lesion; and 2) no nociceptive, peripheral neurogenic, or psychogenic component of the pain. In 28 patients, MRI or CT scan confirmed that at least one brain lesion affected input to the thalamus contralateral to the painful side. In the remaining two patients, the clinical history indicated that such a lesion was present. Several patients had more than one lesion that could be responsible for the pain. In these cases it was not possible to depict the lesion most likely to be responsible for the somatosensory dysfunction. Cross-over trials are associated with potential problems, such as a prolonged effect of active treatment in the first phase, lack of blinding, a placebo response, and a high drop-out rate. Several of these were minimized in the present study: the wash-out period was set at two weeks, and no carry-over effect was seen. We did not ask patients what assumed treatment was given during each period, so we can not exclude that unblinding occurred. However, several points suggest that this was not the case. First, the possibility of side effects was minimized by slowly escalating the drug to a low end-dose. 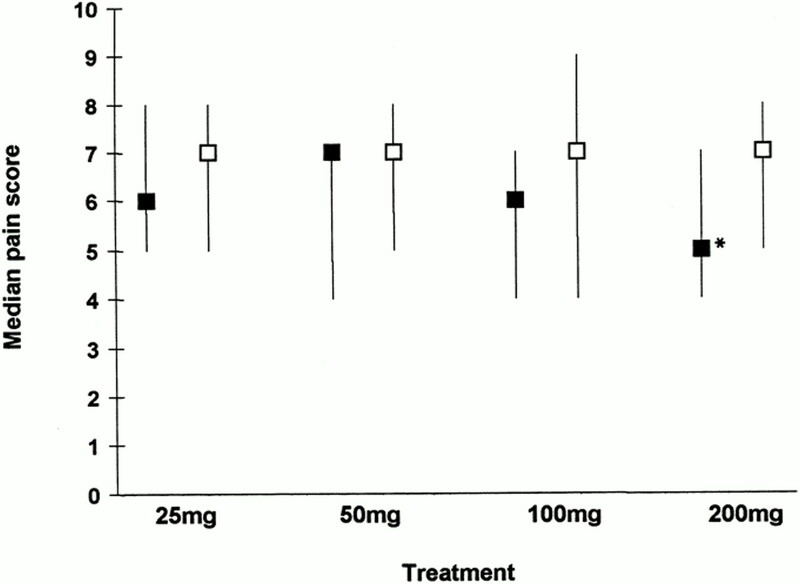 In fact, the number of side effects was similar during placebo and lamotrigine treatment. Second, there was no difference in severity of side effects between lamotrigine and placebo. Third, a dose-dependent reduction of the primary efficacy measure occurred during drug escalation. Finally, reduction of pain was accompanied by a decrease in global pain assessment and on the response to cooling, but not on other efficacy measures. It is therefore unlikely that the present findings can be explained by a systematic bias from unblinding. Although eight patients did not complete the trial, statistical analysis was carried out on an intent-to-treat analysis (i.e., those patients that had at least one dose of lamotrigine on the highest dose) in order to minimize selection bias. Three patients with missing values were included in the final analysis. Two of these patients had better response to placebo than to lamotrigine, so these patients cannot account for the beneficial effect of lamotrigine. The reasons for failure to find an effect on other types of evoked pain (brush and pin-prick) and on area of abnormality is unclear, but these results may simply reflect an inadequate dose of lamotrigine used in this trial. There was no difference between placebo and lamotrigine in the global assessment of pain influence on daily activities. The failure to see an effect on the global pain assessment score may be related to the scoring that was based on the 4-week retrospective assessment during which patients were treated with lamotrigine 100 mg for 2 weeks and 200 mg for 2 weeks, or the corresponding placebo. An assessment based only on the last 2-week treatment period, when patients were taking what appears to be the minimally effective dose of lamotrigine (200 mg/d), might have shown an effect. CPSP is a pain condition of unknown etiology. Clinical studies have shown that partial or complete loss of somatosensory input from the painful side is a necessary, but not sufficient, requirement for central pain because pain does not always occur following even substantial sensory loss in stroke.3,11⇓ In our previous community-based study, pain occurred in 16 out of 87 stroke patients with signs of somatosensory loss.3 The finding that patients with central pain display signs of hypersensitivity in the painful area has led to the proposal that loss of somatosensory input creates a neuronal hyperexcitability in brain structures that have lost their normal afferent input.7 There are many hypotheses about what causes CPSP,31 including: release of disinhibition from a lesion of the medial lemniscal pathways,32 a specific lesion of the spinothalamic pathway causing loss of a normally occurring cold inhibition of burning pain,33 and abnormal bursting activity in the ventral medial thalamic nucleus.34 From the present study, it is not possible to favor one of these hypothesis over the others. However, a neuronal hyperexcitability in certain thalamic structures due to loss of spinothalamic or cortical input to the thalamus seems to be compatible with the present findings of a pain reducing effect of lamotrigine. In a randomized placebo-controlled study,13 it was found that IV administration of the sodium channel blocker lidocaine significantly reduced central pain due to either spinal cord injury or stroke. It was suggested that this most likely was a central rather than a peripheral effect. Little is known about sodium channel expression in CPSP, but an increase in the number of sodium channels has been found within demyelinated lesions in MS.41 Further research on the possible role of central sodium channels in neuronal excitability and pain states is clearly needed. Supported by grants from the Danish Medical Research Council (no. 42820) and the Danish Pain Research Center. Glaxo Wellcome A/S Denmark provided lamotrigine and placebo tablets, technical support, and covered transport expenses for patients to and from the hospital. Dejerine J, Roussy G. La syndrome thalamique. Rev Neurol . 1906; 14: 521–532. Kumral E, Kocaer T, Ertubey NO, Kumral K. Thalamic hemorrhage. A prospective study of 100 patients. Stroke . 1995; 26: 964–970. Andersen G, Vestergaard K, Ingemann–Nielsen M, Jensen TS. Incidence of central poststroke pain. Pain . 1995; 61: 187–193. Bowsher D. Some population data about central poststroke pain. Proceedings 9th world Congress on Pain 1999:435. Abstract. Vestergaard K, Andersen G, Jensen TS. Central poststroke pain. In: Crombie IK, ed. Epidemiology of pain. Seattle, WA: IASP Press; 1999: 155–158. Vestergaard K, Nielsen J, Andersen G, Ingemann–Nielsen M, Arendt–Nielsen L, Jensen TS. Sensory abnormalities in consecutive, unselected patients with central poststroke pain. Pain . 1995; 61: 177–186. Jensen TS, Lenz FA. Central poststroke pain: a challenge for the scientist and the clinician. Pain . 1995; 61: 161–164. Bowsher D, Leijon G, Thuomas KA. Central poststroke pain: correlation of MRI with clinical pain characteristics and sensory abnormalities. Neurology . 1998; 51: 1352–1358. Boivie J. Central Pain. In: Wall PD, Melzack R, eds. --j Textbook of pain, 4th ed. Philadelphia, PA: Churchill Livingstone; 1999: 879–914. Bowsher J. Central pain: clinical and physiological characteristics. J Neurol Neurosurg Psychiatry . 1996; 61: 62–69. Boivie J, Leijon G, Johansson I. Central poststroke pain–a study of the mechanisms through analyses of the sensory abnormalities. Pain . 1989; 37: 173–185. Leijon G, Boivie J. Central poststroke pain–a controlled trial of amitriptyline and carbamazepine. Pain . 1989; 36: 27–36. Attal N, Gaudé V, Brasseur L, et al. Intravenous lidocaine in central pain. Neurology . 2000; 54: 564–574. Awerbuch GI, Sandyk R. Mexiletine for thalamic pain syndrome. Int J Neurosci . 1990; 55: 129–133. Bainton T, Fox M, Bowsher D, Wells C. A double blind trial of naloxone in central poststroke pain. Pain . 1992; 48: 159–162. Taira T, Takinawa T, Kawamura H, Iseki H, Takatura K. Spinal intrathecal baclofen suppresses central pain after a stroke. J Neurol Neurosurg Psychiatry . 1994; 57: 381–382. Bennett GJ, Laird JMA. Central changes contributing to neuropathic hyperalgesia. In: WD Willis Jr, ed. Hyperalgesia and allodynia. New York: Raven Press;1992:305–310. Brodie MJ. Lamotrigine. Lancet . 1992; 339: 1397–1400. Zakrzewska JM, Chaudhry Z, Nurmikko TJ, Patton DW, Mullens EL. Lamotrigine (Lamictal) in refractory trigeminal neuralgia: results from a double-blind placebo controlled cross-over trial. Pain . 1997; 73 (2): 223–230. Simpson DM, Olney R, McArthur JC, Khan A, Godbold J, Ebelfrommer K. A placebo-controlled trial of lamotrigine for painful HIV-associated neuropathy. Neurology . 2000; 54: 2115–2119. Luria Y, Brecker C, Daoud D, Ishay A, Eisenberg E. Lamotrigine in the treatment of painful diabetic neuropathy: a randomized controlled trial. Proceedings 9th world Congress on Pain 1999:188. Abstract. Nakamura–Craig M, Follenfant RL. Effect of lamotrigine in the acute and chronic hyperalgesia induced by PGE2 and in the chronic hyperalgesia in rats with streptozotocin-induced diabetes. Pain . 1995; 63: 33–37. Canavero S, Bonicalzi V. Lamotrigine control of central pain. Pain . 1996; 68 (1): 179–181. Carrieri PB, Provitera V, Lavorgna L, Bruno R. Response of thalamic pain syndrome to lamotrigine. Eur J Neurol . 1998; 5: 625–626. Merskey H. Classification of chronic pain: descriptions of chronic pain syndromes and definition of pain terms. Pain . 1986 (suppl 3): 1–225. Sindrup S, Jensen TS. Efficacy of pharmacological treatments of neuropathic pain. An update and effect related to mechanism of drug action. Pain . 1999; 83: 389–400. McCleane G. 200 mg daily of lamotrigine has no analgesic effect in neuropathic pain: a randomized, double blind, placebo controlled trial. Pain . 1999; 83: 105–107. Messenheimer J, Mullens EL, Giorgi L, Young F. Safety review of adult clinical trial experience with lamotrigine. Drug Safety . 1998; 18: 281–296. Teaoh H, Fowler U, Bowery NG. Effect of lamotrigine on the electrically-evoked release of endogenous amino acids from slices of dorsal horn of the rat spinal cord. Neuropharmacology . 1995; 34: 1273–1278. Lees G, Leach MJ. Studies on the mechanism of action of the novel anticonvulsant lamotrigine (Lamictal) using primary neuroglial cultures from rat cortex. Brain Res . 1993; 612: 190–199. Craig AD. Functional anatomy of the supraspinal pain processing with reference to the clinical pain syndrome. In: Max M, ed. Pain 1999–an update and review. Seattle, WA: IASP Press; 1999: 87–96. Head H, Holmes G. Sensory disturbances from cerebral lesions. Brain . 1911; 34: 102–254. Craig AD. A new version of the thalamic disinhibition hypothesis of central pain. Pain Forum . 1998; 7: 1–14. Lenz FA, Dougherty PM. Pain processing in the human thalamus. In: Steriade M, Jones EG, McCormick DA, eds. Thalamus vol. II, experimental and clinical aspects. Amsterdam: Elsevier;1997:617–652. Rinaldi PC, Young RF, Albe–Fessard D, Chodakiewitz J. Spontaneous neuronal hyperactivity in the medial and the intralaminal thalamic nuclei of patients with deafferentiation pain. J Neurosurg . 1991; 74: 415–421. Lenz FA, Kwan HC, Martin R, Tasker R, Richardson RT, Dostrovsky JO. Characteristics of somatotopic organization and spontaneous neuronal activity in the region of the thalamic principal sensory nucleus in patients with spinal cord transection. J Neurophysiol . 1994; 72: 1570–1587. Jeanmonod D, Magnin M, Morel A. Thalamus and neurogenic pain: physiological, anatomical and clinical data. Neuroreport . 1993; 4: 475–478. Koyama S, Katayama Y, Maejima S, Hirayama T, Fujii M, Tsubokawa T. Thalamic neuronal hyperactivity following transection of the spinothalamic tract in the in the rat: involvement of the N-methyl-D-aspartate receptor. Brain Res . 1993; 612: 345–350. MacDonald RL, Kelly KM. Antiepileptic drug mechanisms of action. Epilepsia . 1993; 34 (suppl 5): 1–8. Max BM, Hagen NA. Do changes in brain sodium channels cause central pain? Neurology . 2000; 54: 544–545. England JD, Levinson SR, Shrager P. Immunohistochemical investigations of sodium channels along nodal and internodal portions of demyelinated axons. Microsc Res Tech . 1996; 36: 445–451.